A poignant and moving account of a family's loss. A phone call in the night, an ambulance, A&E and the beginning of a family’s nightmare. A mortally sick child is every mother’s horror movie, even when the child is a young man in the prime of life. But this is a false alarm, it’s not life threatening after all. Or is it? Can this mother believe what she is told…? She will fight for the truth; uphold her boy until he needs her support no longer. 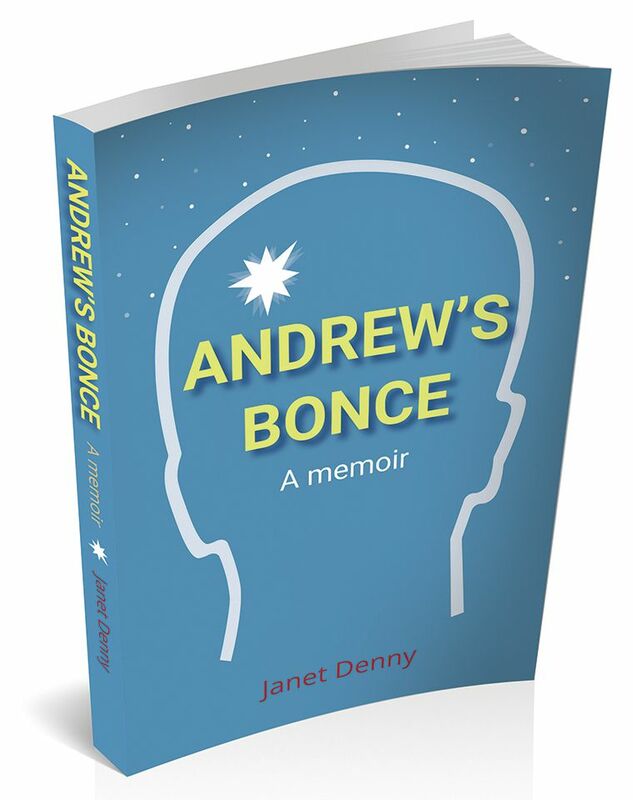 Andrew's Bonce: A memoir is a harrowing but celebratory book about Janet’s extraordinary, ordinary son. Janet Denny grew up in London. She trained as a nurse at Westminster Hospital and went on to become a midwife and health visitor. She began writing stories in her head when her family embarked on restoring a derelict fifteenth-century farmhouse in Sussex. While scraping rot from woodworm-eaten timbers and repointing old brickwork, she was able to let her imagination fly. More tales followed, recounting village life and the unexpected adventures of a bed and breakfast hostess. After twenty-five years running a busy retail business, Janet returned to "fiddling around with words”. In 2014 she graduated with an MA in Creative Writing. Her particular interest is in memoir and biography. Janet’s first book, The Man on the Mantelpiece, won The One Big Book Launch Competition and was featured in the main section of The Daily Telegraph and on the front page of The Guardian Family. She has been invited to speak at prestigious literary festivals. Andrew's Bonce: A memoir is her second book and she is currently working on a novel. View the Advance Information (AI) sheet here.